Although Christmas is over, I am still playing catch-up when it comes to updating my blog with the Christmas cookies I managed to make this year. My goal was 12. I’ve got a few more to post, but I’m not sure I quite made it to 12. Still, I made lots of other desserts this year, so certainly no regrets. Preheat oven to 375. In large bowl combine butter, sugars, and vanilla, beat until creamy. Beat in eggs. Gradually add dry ingredients. Roll teaspoons full of dough into balls and place in mini muffin tin lined with paper liners. Bake 12 minutes. 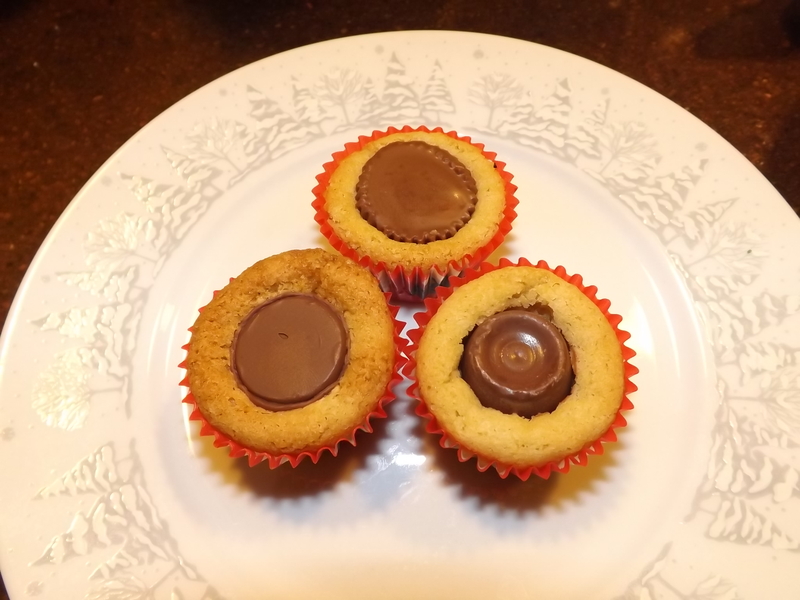 Remove from oven and immediately press unwrapped chocolates into center of each muffin cup. These were a big hit with the kids as well as the adults that visited our home this holiday season. Definitely a cookie I’ll be making again throughout the year, and for this I am — Simply Grateful. The last of my creations with crepes this week was a combination of two of my absolute favorites: Chocolate and Strawberries! To prepare the crepes: Place all crepe ingredients in blender and process until smooth. Refrigerate for 30 minutes. When batter is chilled, heat a small fry pan over medium heat. Spray pan with cooking spray. Pour enough batter into hot pan to cover the bottom. Cook until top has a dull finish. Flip and cook an additional 15 seconds. Remove from pan and separate with waxed paper sheets. To prepare chocolate creme: In a large mixing bowl beat cream cheese and sugar until fluffy. Beat in sour cream and vanilla. Fold in liquor and whipped topping. Refrigerate. Before assembly, mix strawberries with brown sugar and let sit 30 minutes. To assemble: Place a chocolate crepe on plate; spread 2 Tbsp. cream down center of crepe; top cream with sugared strawberries and roll. Garnish with whipped cream, hot fudge, and additional strawberries. 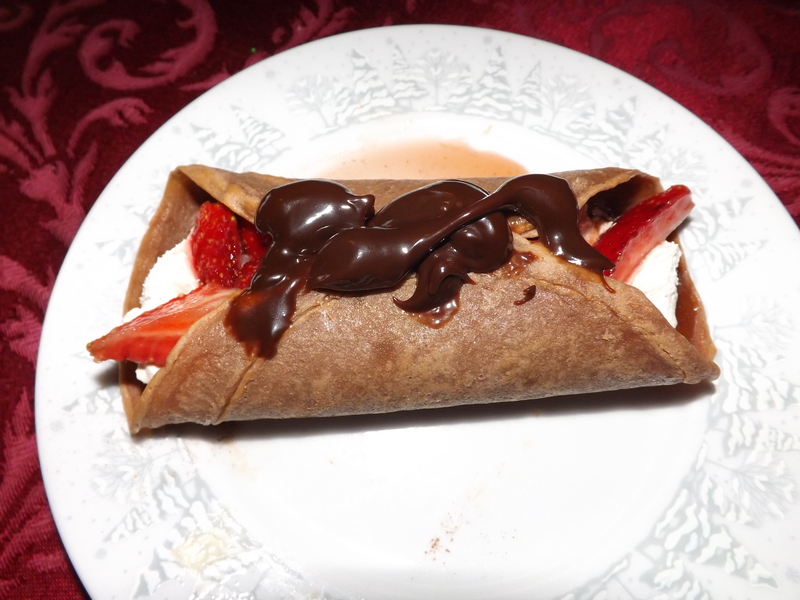 If you want it ever more chocolatey, you can use additional hot fudge in crepe before rolling. These crepes are sure to satisfy even the toughest of chocolate cravings, something I am always on the lookout for, and for this I am — Simply Grateful. A favorite dessert at the holidays around our house is Tiramisu. The only trouble with this dessert is that it tends to be heavy and filling. Almost too filling after a big meal. So, making this into a lighter crepe version works out perfectly when having a holiday dinner party. First, make the crepes. In a blender, combine eggs, milk, soda, butter, coffee and vanilla. Beat until well combined. Add flour and sugar and mix well. Cover and refrigerate for 30 minutes. Heat a small skillet over medium heat and spray with cooking spray. Pour just enough batter into heated pan to cover bottom. Cook until top of crepe has a dull finish. Flip and cook an additional 10 seconds. Remove from pan. When cool, stack on plate with waxed paper in between. Next, make filling. In large mixing bowl beat cheeses until smooth. Add sugar and beat till fluffy. Stir in Kahlua and vanilla until well combined. Chill until ready to use. 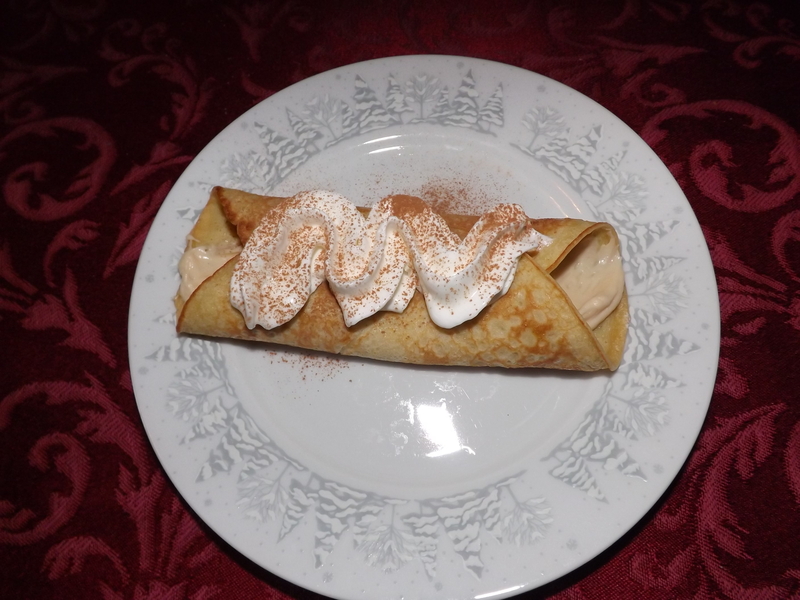 To assemble, place crepe on plate, spoon two tablespoons of cream filling down center, roll up. Top with whipped cream and sprinkle with cocoa. This crepe is much lighter than the traditional tiramisu making it possible to enjoy maybe more than one after dinner, if you are so inclined, and for this I am — Simply Grateful. I love to serve dessert crepes to guests. They are super impressive and super easy. Two of my favorite characteristics when making any dessert. Recently I decided to try combining three of my favorite tastes into one crepe: tart cherries, red velvet, and cream cheese. Thus emerged my Black Forest Cherries Jubilee Crepe. The base for the Black Forest Cherries Jubilee Crepe is a red velvet crepe. On top of this is spread a fluffy cream cheese filling, then topped with cherries jubilee, folded, and garnished with a dab of whipped cream. Decadent in every way. The first step to making these crepes is to prepare the crepe batter. In a blender, beat eggs until light. Add remaining ingredients and blend until smooth. Let stand 5 minutes. Heat small fry pan over medium heat and spray with cooking spray. Pour just enough batter in pan to cover the bottom of the pan. Cook until the top of the crepe has a dull finish. Flip and cook for 10 seconds more. Place a sheet of wax paper between each crepe. These can be refrigerated until used or frozen if not using right away. Next, prepare the cream filling. In a small bowl, beat the whipping cream until stiff peaks form; set aside. In a large bowl, beat the cream cheese, powdered sugar, and vanilla until smooth; fold in whipped cream. Chill until ready to serve. Finally, it’s time to make the cherries jubilee. For this, in a fry pan, heat the cherry pie filling. In a separate small pan, heat the brandy. When ready to serve, bring the cherries and brandy to the table, slowly pour the brandy over the warm cherries, light with a long match and watch the blue flames. To assemble the crepes. 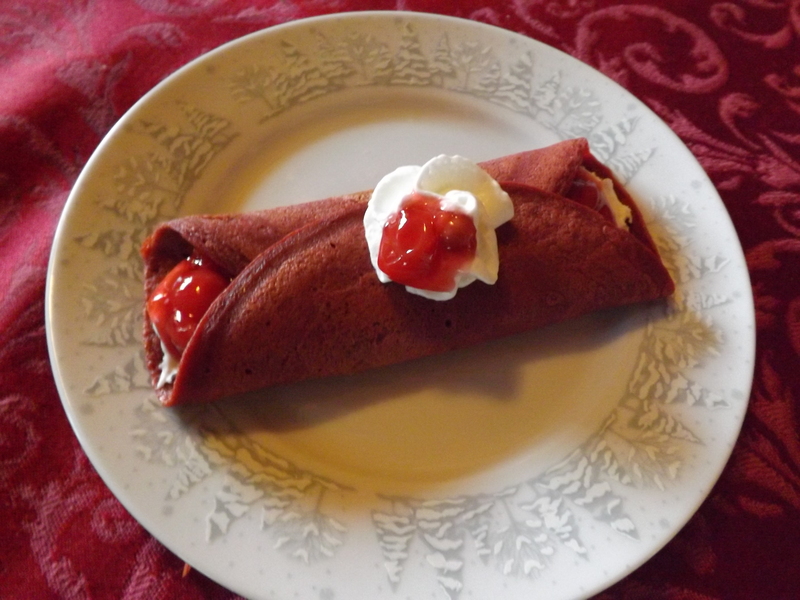 Start with a red velvet crepe, spread 2 heaping tablespoons of cream down the center of crepe, top with 2 tablespoons of cherries jubilee, roll up. Top with a dab of whipped cream and garnish with a single cherry. This is one of the most decadent crepes I make and one of the best received. Anytime you serve something that is flaming, it is sure to be a hit. This recipe might sound like a lot of work, but it really isn’t. It is well worth giving a try. I did, and for this I am — Simply Grateful. When Hubby and I began dating, I was not the least bit adventurous when it came to trying new foods. Being that he was from a different ethnic background – Serbian, I learned rather quickly that I had to learn to at least be somewhat open to trying things beyond my comfort zone. This was difficult for me, as I was a hamburger and hot dog kinda girl. Yogurt, cottage cheese, even polish sausage were not things I would consider eating. I’d have to say I was rather boring and unsophisticated. Growing up my mother had around 20 different meals that she made using beef, pork roast, and chicken breasts. She never made Chinese food; of Italian dishes she only made spaghetti; Mexican she only made tacos; and the remaining dishes were either grilled or what I consider “American” food – hamburgers, meatloaf, beef stew, roast beef, pork roast, very rarely roast chicken, and ribs. Very limited, although what she did make was good. After a few months of dating Hubby, going out to dinner or lunch got old, so I began to experiment a bit in the kitchen. My mother taught me very little about cooking. I had a home economics class in junior high, but about the only thing I remember making there was zucchini muffins, which I refused to eat (zucchini, YUK! right?). So everything I learned about cooking was a hands-on learning experience. Some meals turned out pretty good, some were inedible, and others needed improvement. The more I cooked, the more I wanted to try new ingredients and recipes. This has continued through the years and now, although I might not eat some of the recipes I make, I am more than willing to try making practically anything. Hubby is a more than willing guinea pig and even the kids have enjoyed some of my culinary experiments. When Hubby and I got married I asked him what meals from his heritage he wanted me to make. He told me flatly, “None!” His mother was not a bad cook, but growing up in Serbia she had little opportunity to experiment with different ingredients. Having food to eat was the objective. Pigeon soup, biscuits with scraps of bacon fat, and smoked meat with bread were some of the highlights. Still, whenever we went over to his parents house for dinner, his mother always put out a very nice spread showcasing many things she’d enjoyed making since arriving in America some 40+ years ago and Hubby ate it. Some of them were her take on American dishes and others were meals that she had learned to make from her mother, but had little opportunity to make because of not having the ingredients. If there is one thing I am good at, it is observing. This is what I have done for the past 20+ years of being with Hubby. I have watched him eat his mother’s cooking and enjoy it. Not everything, but there are definitely some things he truly loves, although I’m not sure he’d admit it. One of the meals that he always enjoys when we are over there is lamb paprikash, which is a traditional Christmas meal for them. I have never been crazy about lamb, but this is one method of preparation that I do enjoy. Now that Hubby’s mother is no longer able to have holiday dinners, I decided this year I would give making lamb paprikash a shot. I had no recipe, as my mother-in-law has nothing written down, no measurements for ingredients, and speaks broken English. I decided to go on taste and memory for this one. Basically I figured making lamb paprikash had to be similar to beef stew and took it from there. The results were a success. Hubby told me it was better than his mother’s. But let’s keep that between us — his mother and I don’t get along that well already, this would certainly not help matters in that department. For me the most important characteristic of any meat that I serve is that it be tender. To attain this in a stew, I cook it all day. The first step was to sear the leg of lamb in the pot and brown it on all sides, salting as I turned it. Once brown, I filled the pot with water, covering the lamb completely. Bring the pot to a boil. Cover and simmer anywhere from 4 to 6 hours. When the lamb falls away from the bone, remove from the pot and cut into chunks. Some of mine turned out to be shreds, which is fine too. Return the lamb to the pot and bring to a slow boil. In a small fry pan, melt butter and cook onion until tender. Add to pot. 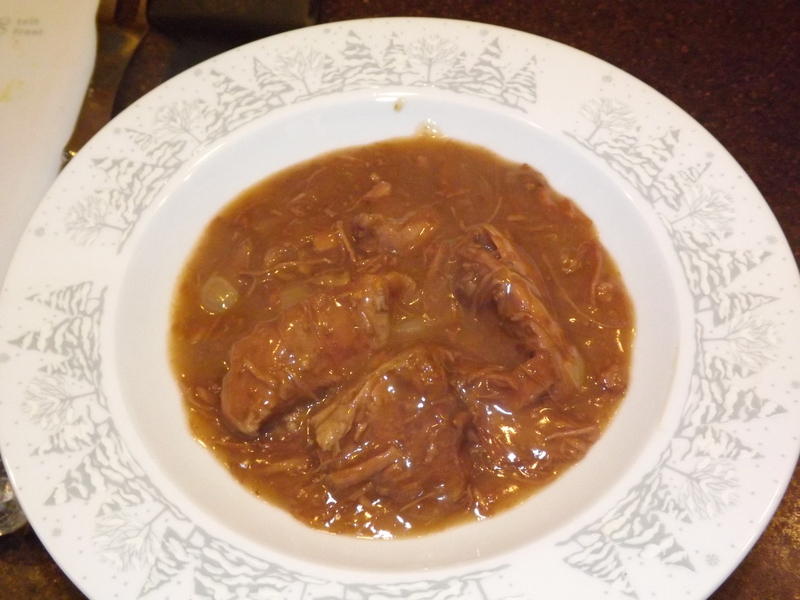 To thicken paprikash, melt bacon grease in fry pan, add flour and use broth from the paprikash to make a rue. Slowly mix the rue into the paprikash and cook for 45 to 60 minutes longer. The only difference I would make in this recipe next time is to add the sautéed onion earlier so it’s flavor incorporates more into the gravy. Giving Hubby a taste of home is important to me. Family recipes are a treasure to pass down through generations and now I have one from Hubby’s mother for books, and for this I am — Simply Grateful. Back when I was a young girl, every couple of years my family would head up north to a family reunion on my father’s side. We’d spend a weekend on the farm of one of our cousins hiking, talking, playing horseshoes, riding motorcycles, picking apples, and tubing down the Ausable River. Most of all, though, we ate. Everyone brought food, everyone made food, and everyone ate food. There was absolutely no chance of anyone going hungry, because there was always something cooking. From 5 in the morning until well after midnight, everyone fought over who was going to get the kitchen next. When my children came along, the family reunion had all but stopped. Thankfully, one of my cousins took it upon herself to organize one last hoorah. I took the opportunity to spend the weekend taking pictures of the old farm, hiking along the trails for one last time with my children, and gathering recipes from my cousins. One recipe that I am thankful I got was from my cousin Linda. She was famous for making her peanut butter fudge every time there was a family reunion. It was popular with the kids, of course, but the adults loved it just as much. That last time we gathered at the farm, Linda taught me how to make her fudge. I’m not sure I would have been able to make it had she just given me the recipe. Not being familiar with making fudge, I was terribly intimidated by it. After watching her do it however, I realized that fudge wasn’t something to be afraid of. I really should have gotten a bigger bowl to store this in. I guess we’ll just have to eat until we can fit the lid on. Bring sugar and milk to boil over medium heat. Heat to soft-ball stage — 235 degrees. Linda never used a thermometer. She used a bowl of ice water and dropped some of the sugar and milk mixture into it after it had been boiling for a while. I use both. I wait until it reaches 235 and then start testing for the soft-ball stage. It isn’t an instantaneous thing that once it reaches 235 it’s done, so be sure to test. Once the mixture reaches the soft-ball stage, add the butter and stir until melted. Remove from heat and add creamy peanut butter. Pour immediately into buttered or foil lined 9×9 baking pan. Refrigerate until set. I prefer to put my fudge in a foil lined pan because it makes it much easier to remove from the pan. Not even a year after the reunion we lost Linda very unexpectedly. It was a terrible shock to the entire family. After her funeral the family gathered together and reminisced. 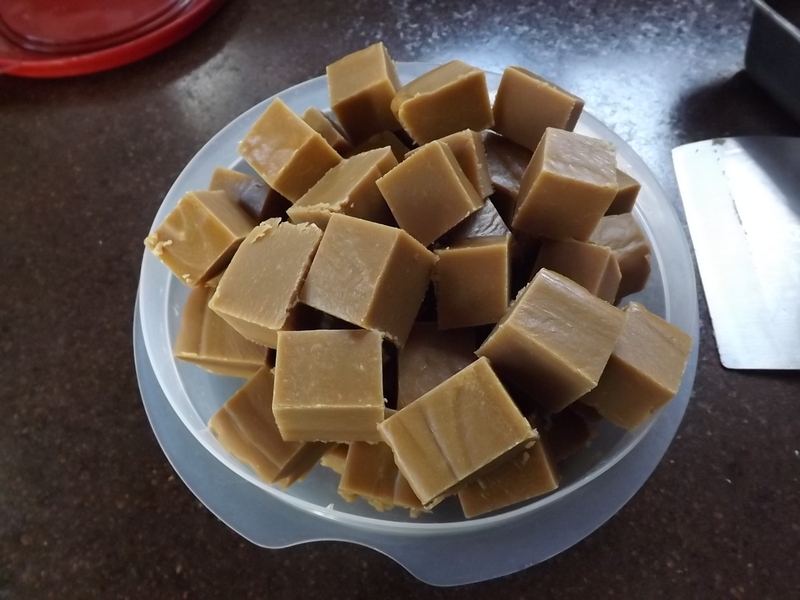 I brought up her peanut butter fudge and everyone agreed it was the best they’d ever tasted. Many in the family commented that they wished they had learned how to make it. I’m not sure that mine lives up to Linda’s, but it is one of my families favorites and a recipe I hope to pass down for many generations. It has become a Christmas tradition in our family. I am sorry Linda is no longer with us but she will forever live on in the memories and recipes she left behind, and for this I am — Simply Grateful. Serving frozen desserts to a crowd can be cumbersome and inconvenient. When I found a set of square mini dessert/appetizer bowls, I knew these would definitely make serving these creamy frozen fruit cups easy. Combine cream cheese and sugar in mixer and beat until fluffy. Chop maraschino cherries. Add cherries and pineapple to cream cheese mixture. 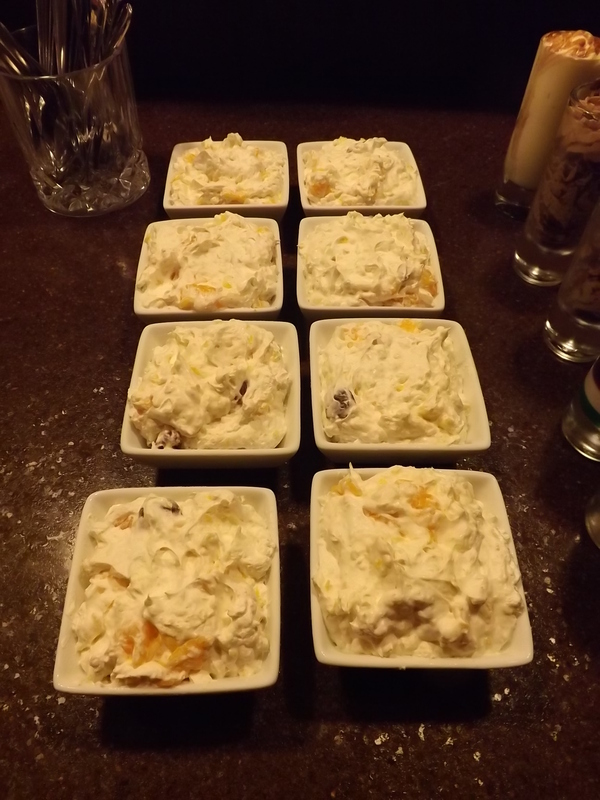 Fold in mandarin oranges and whipped topping. Spoon fruit mixture into cups and freeze until firm. Remove from freezer 10 minutes before serving. I love this recipe, especially because it was one I was able to use my home-canned Maraschino Cherries and crushed pineapple in. Whenever I can use something from the pantry that I made during the past year, I find the dessert even more tasty, and for this I am — Simply Grateful. I used to think that making candy was a long and involved task, but then realized that many candies are just ingredients covered in chocolate. What could be better? Chocolate on top of almost anything makes it better, so covering fruit, nuts and other salty snacks with chocolate makes the perfect candy. This afternoon Zeb and I spent an hour and a half working on three different chocolate covered concoctions and now have enough candy for Grace to give as gifts to all her coworkers, to send to a friend in Florida, and to give to our neighbors. Time well spent! There are several ways to attain just that right blend of chocolate for covering various ingredients. One is to buy the prepared chocolate dip in the baking section at the grocery store, another is to use a combination of milk chocolate, dark chocolate, and semi-sweet chocolate baking chips, and my favorite — buying chocolate from a candy making specialty shop. 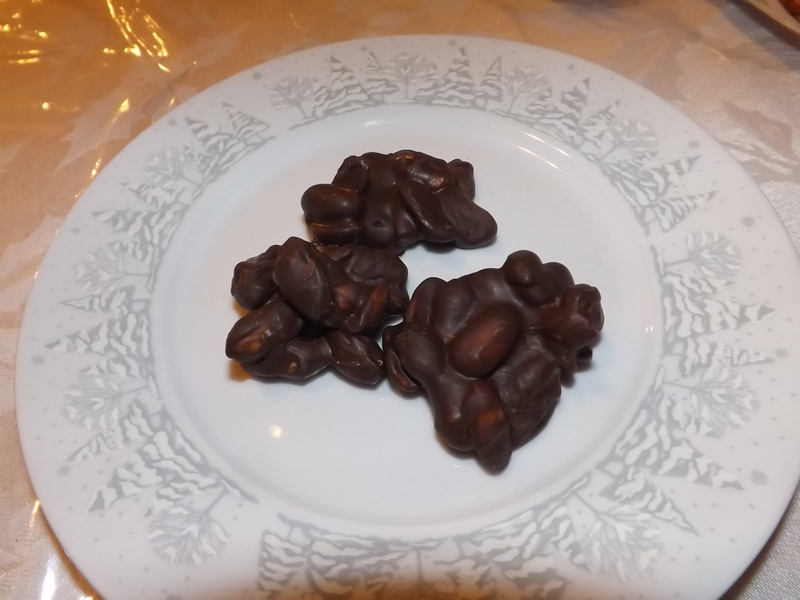 My favorite chocolate to use when covering fruit or nuts is Nestles. At the specialty shop in our area I buy both milk and dark chocolate and then use a combination of the two to attain a not too sweet chocolate, perfect for dipping. 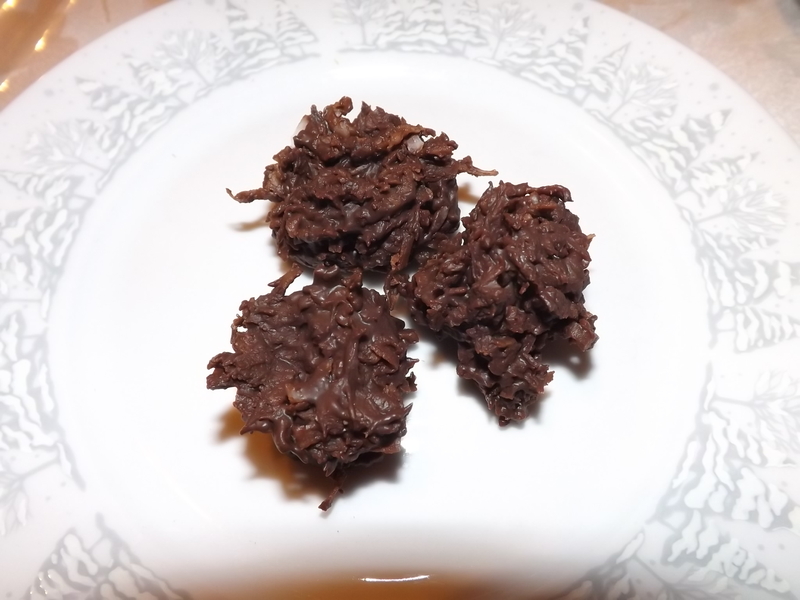 Using baking chips, however, works just as well in a pinch, as does the prepared chocolate dips. I just like having an excuse to go to the specialty chocolate shop. There’s always so many fun things to see. Once you have your chocolate melted, either in a double boiler or the microwave, all you need to do is add the nuts, coconut or fruit. 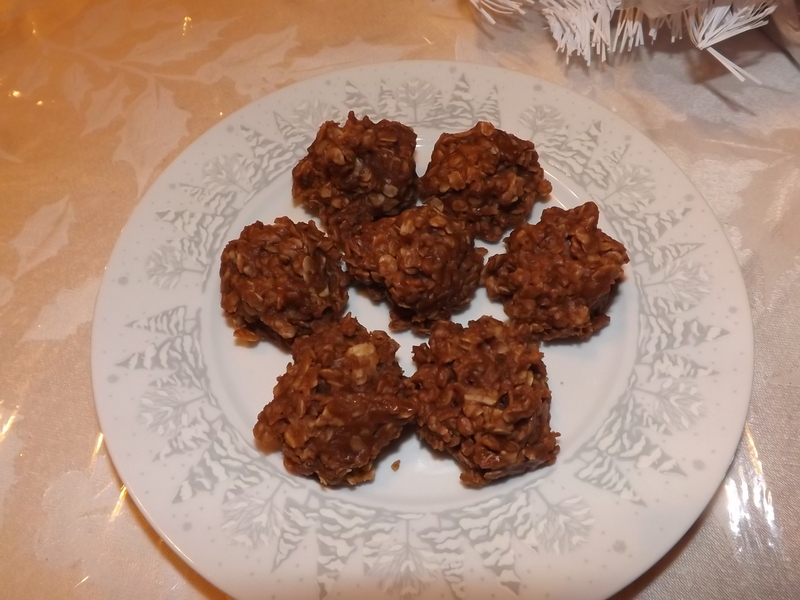 Today I added peanuts to make peanut clusters and coconut to make coconut clusters. 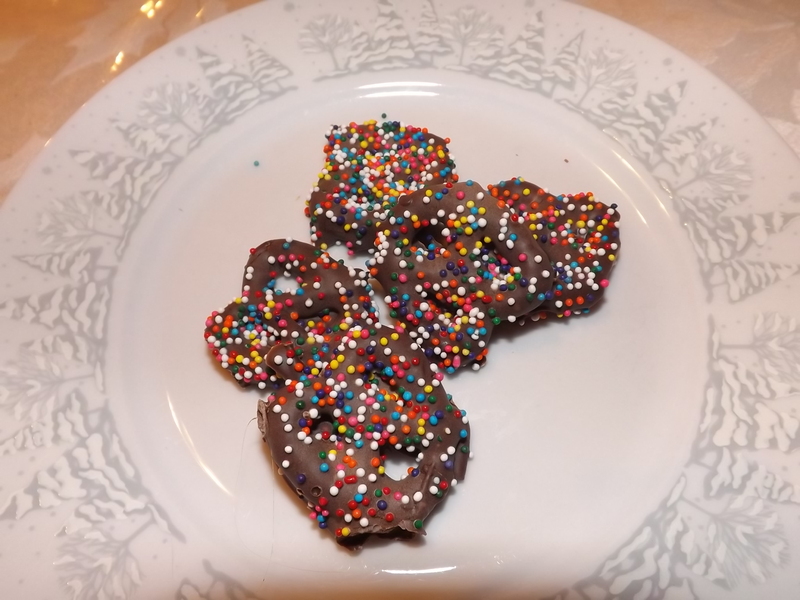 Once those two were setting in the garage (as it’s fairly cold out so I didn’t need to put them in the freezer) we set to work on melting more chocolate and dipping mini pretzels. Then while they were still wet we sprinkled them with nonpareils. Quite festive, don’t you think. There are so many other things you can dip or cover in chocolate: Raisins, cherries, cranberries, pineapple, almonds, and even potato chips. Now I’ve got a list of things to work on tomorrow. There’s no such thing as too much candy or too much chocolate, and for this I am — Simply Grateful. This cookie is really a cheat cookie if you ask me. It is too easy to make to be considered cooking. To me, this tastes more like candy than a cookie, thus why it ended up being made today — the day I spent making Christmas candy. Back about eight years ago I was working in a fruit market and took the kids with me to work every day — yes, my boss completely supported my choice to home school my children. Anyway, the employees at the market were all very nice and truly loved my kids and chatting with them. One morning one of the cashiers came into the office and brought the kids a big plate of these cookies. Needless to say they were devoured before lunch. She gave me the recipe and for years it sat in my recipe box with my continued claims of intentions to make them. It never happened — not until today. Why I waited so long I’ll never know, but these were so quick and easy and delicious that I can’t wait to make another batch tomorrow after I pick up some more peanut butter. Combine sugar, coco, milk and butter in pan over medium heat. Bring to a light boil and then add peanut butter. Cook until melted. Take off heat, add vanilla and oatmeal. Drop rounded teaspoon fulls on wax paper. That’s it! Quick, easy, and with ingredients I typically have in the pantry — except around Christmas when everything gets low, no matter how much planning I do. These cookies can pass for candy in my book, or cookies in a pinch. Today Zeb and I made these, licked the pot clean, and ate nearly half of them already, not a bad way to spend the afternoon, and for this I am — Simply Grateful. Making a cookie that has more than one flavor going on, is my favorite type of cookie. It’s like getting the best of two worlds. 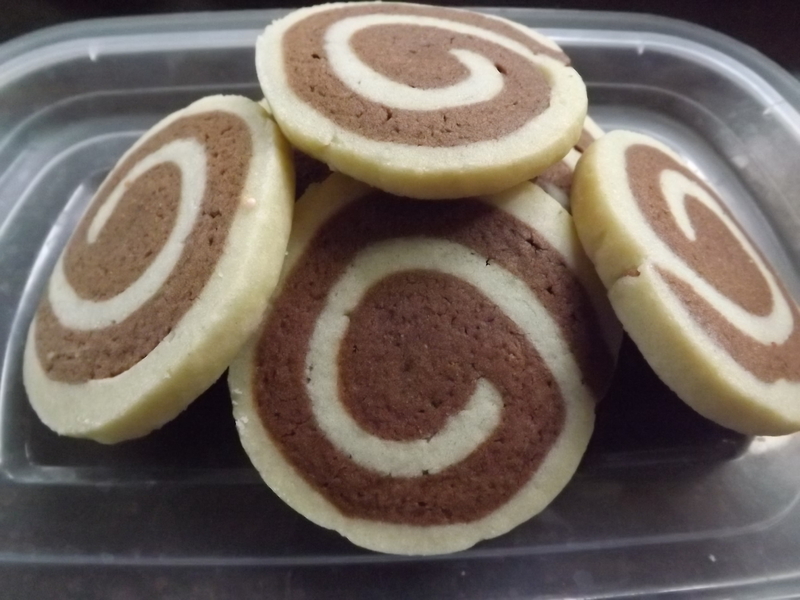 That’s what I found with these chocolate pinwheel cookies. This particular recipe is not very sweet. In fact, I would have to say they are rather bland. Not a bad thing, just not bursting with chocolate flavor. Hubby likes these with tea and I like them for a change from the deep, rich chocolatey flavor of my Chocolate Cake Mix Crinkles. I do have another recipe for chocolate pinwheels that I still want to make that uses more of a frosting layer between the vanilla cookie. I have not tried this one yet, but it is on the list for this holiday season. For now, if you are looking for something that is more along the lines of a shortbread type cookie, this is the one. Combine coco with melted butter and milk. Mix well and set aside. Add egg yolks, beating well after addition. Add vanilla and milk and mix well. At low-speed gradually add the dry ingredients. Increase speed until dough pulls away from side of bowl. To half the dough, mix in the coco mixture. On wax paper or pastry board, roll out 1/2 of the vanilla dough to make an 8×7 rectangle. Do the same with half of the chocolate dough. Place the chocolate rectangle on top of the vanilla and press together lightly. Roll the dough tightly from the short end and wrap in plastic wrap. Repeat with remaining vanilla and chocolate dough. Place wrapped dough in refrigerator for 30 minutes. When ready to bake, preheat oven to 325. Slice logs to about 1/4 thickness with a sharp knife. Place cookies on parchment lined cookie sheet and bake 15 to 20 minutes. I like these cookies as they are when I don’t want something too sweet or want to dip them in milk. If you wanted to make it more chocolatey, you could always frost with some chocolate butter cream frosting or even better some chocolate bitter-sweet frosting. I’ll have to post the recipe for that frosting soon, it is awesome. These cookies are a bit more time-consuming to make than a drop cookie because of the rolling out and the two layers, but well worth the effort. They look impressive and although not bursting with flavor, they are still a tasty treat, and for this I am — Simply Grateful.